On March 5, the bishop turned 59 years old. Because he as well as many seminarians have to leave the Seminary for pastoral work on weekends, the celebration took place on Thursday, March 3. 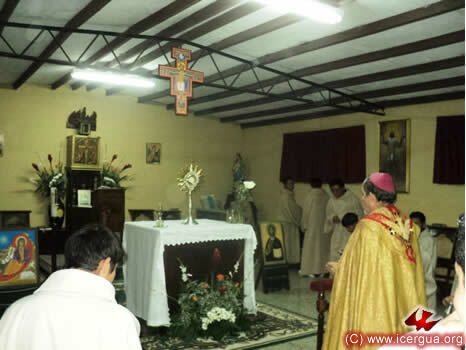 The celebration began with the solemn blessing with the Most Holy Sacrament, which is seen in the photograph at left. Then the Solemn Eucharist was celebrated in honor of the Most Holy Virgin Mary, Mother of the Church. Finally, supper together. 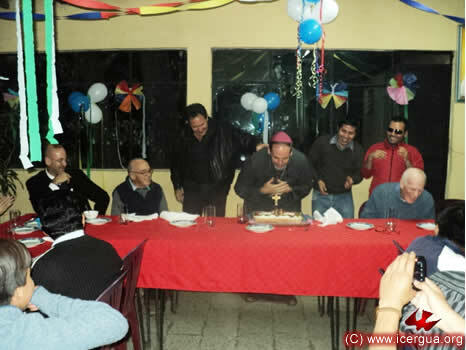 The seminarians led by Father Juan Moisés and with the help of some other presbyters organized a great celebration. The bishop’s brothers were also invited, and Gerardo and Federico were able to come. Also present were Dr. David Greene, a professor in the Seminary, and Sr. Giancarlo Norris, Director of the Rekko Project and friend of the Communion. A special moment was singing Happy Birthday. Right: The bishop is trying with great effort to blow out the trick candles on the cake, and having great difficulty in getting them to stay unlit. 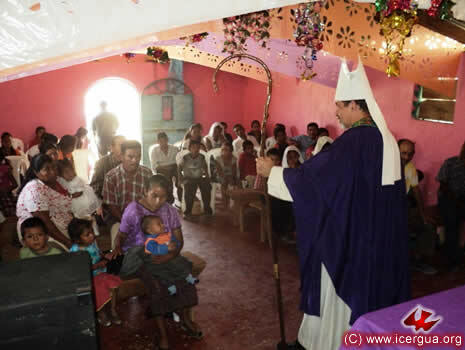 On Friday, March 4, Monsignor Eduardo visited the Pajomel Community, Santa Cruz La Laguna. 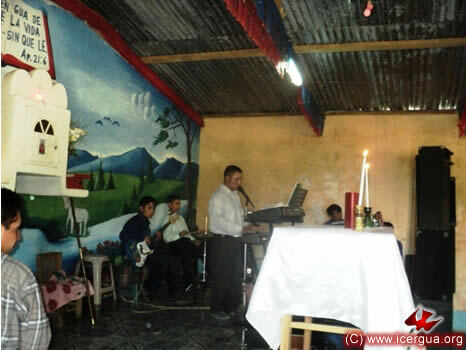 With the Eucharist, the community began to celebrate the fourteenth anniversary of the Music Ministry. Almost all the members of the Ministry have changed since the beginning, for the majority are young people. Still, it has maintained the tradition of beautifully celebratory music. 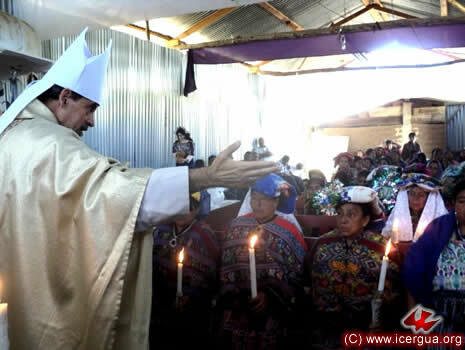 In the late afternoon of March 4, the bishop visited the Chuitzanchaj Community for the monthly Eucharistic celebration. The community is characterized by its participatory organization and internal harmony, which have resulted in sustained growth. 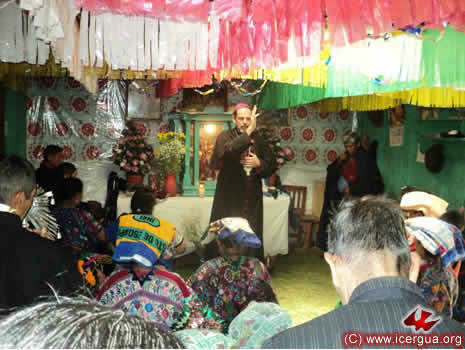 On the morning of March 5, the bishop arrived at the Xolbé Community in the municipality of Sololá. 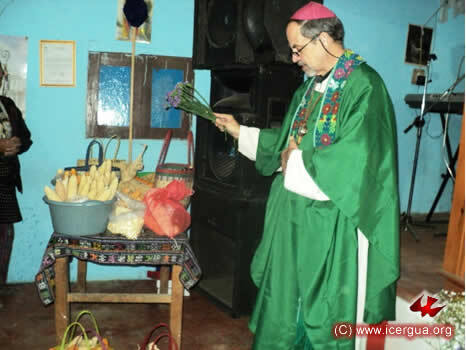 The celebration was to pray for the sowing of seeds, which will begin soon, and to perform the blessing of the seeds. Right: The bishop blessing the seed. On Sunday morning, March 6, Monsignor Eduardo and four seminarians made a pilgrimage to the top of the Yepocapa and Acatenango peaks. 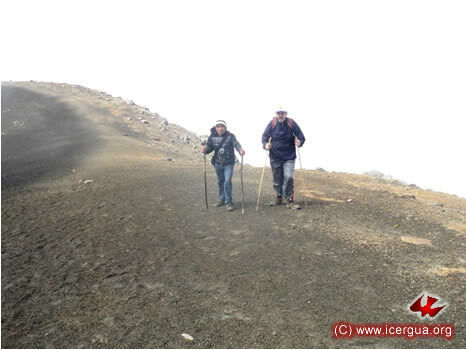 Left: The bishop and seminarian Jorge Tomás approaching the summit of Acatenango. 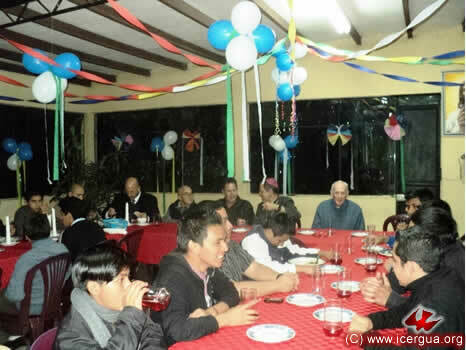 Left: The same seminarians along with the bishop on the top of Yepocapa after celebrating Eucharist and eating some food. 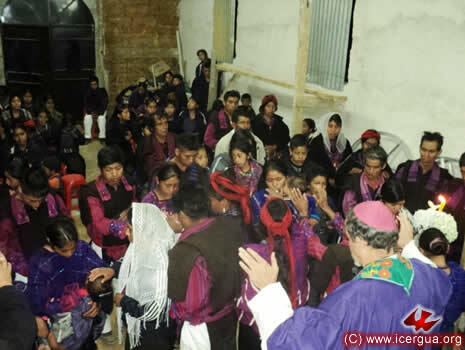 On Ash Wednesday the bishop began the Lenten celebrations in the San Miguel Parish, Tzanixnam, Totonicapán. The faithful were well prepared, and turned out in great numbers to begin the Lenten journey. The celebration began with the administration of the Sacrament of Reconciliation. After confessing sins, each one of the faithful came forward to receive absolution. After the homily, in accord with the liturgy, there followed the blessing and placing of ashes as a sign of the decision to set off on the road to conversion. On Saturday, March 13, our bishop began his pastoral visit in Los Angeles by celebrating Eucharist in the central seat of the Parish, located at 227 Jefferson and Hill, Los Angeles. 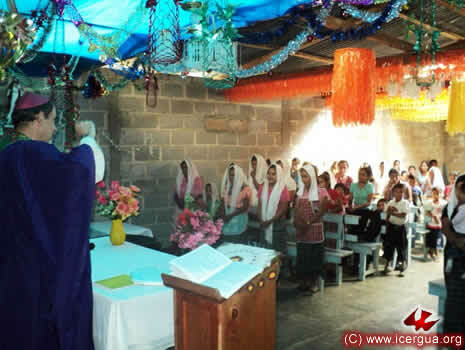 In spite of the difficulties that the faithful have had to face, they have great enthusiasm in carrying out the mission that they have received from the Lord to evangelize and to experience the one, holy catholic and apostolic church with all the characteristics with which the Lord founded it and which the apostles experienced. The faithful have also tried to join the use of technology to the faith as a means of evangelism. 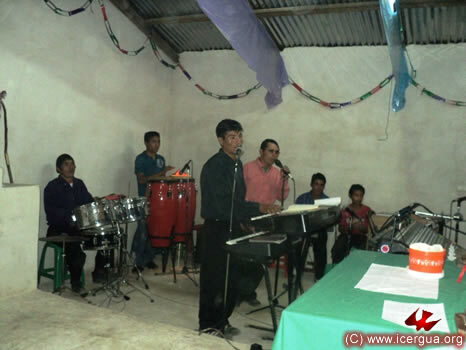 Often the activities are transmitted via internet or through the link with Radio Nueva Vida de Nucá, Santa Cruz Barillas, Guatemala. Soon they will begin to transmit from Los Angeles every day from 7 to 9 pm, Pacific Time. Above and left: The Eucharistic celebration. 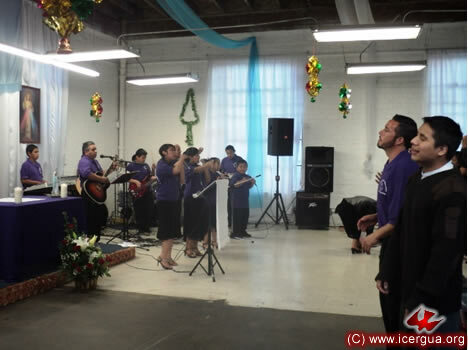 The members of the Music Ministry are wearing violet shirts, the color of Lent. Brother Victor has also made a beautiful chasuble for the bishop to use during his visits to Los Angeles. 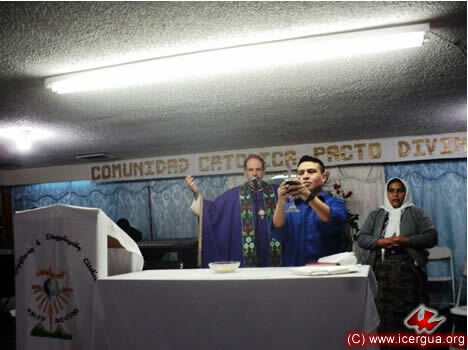 At the end of the afternoon, Monsignor Eduardo presided at the celebration of Reconciliation and Eucharist with the faithful in the Pacto Divino Ministry, located on Sixth Street in the center of Los Angeles. The faithful are committed to be the presence of the Kingdom and to proclaim the Gospel where they live. 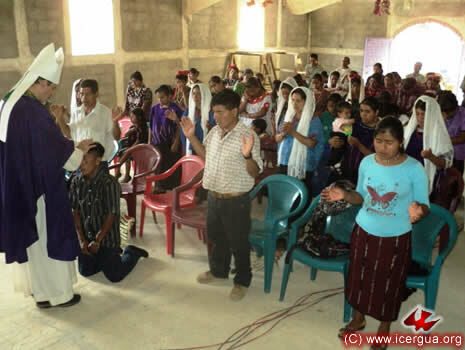 The greater part of the faithful in this ministry come from the K’iché area. 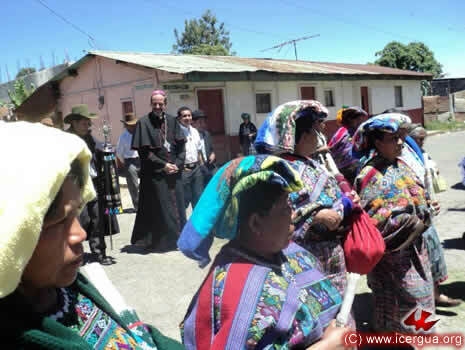 Most are from the Department of Totonicapán, although some are from around Sololá. Above: The faithful coming forward to receive absolution after confessing their sins and invoking the outpouring of the Holy Spirit. 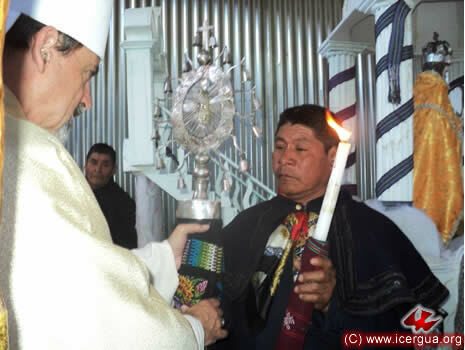 Right: Brother Nicolás, communion minister, presenting the chalice in the name of the whole community. MARCH 12. 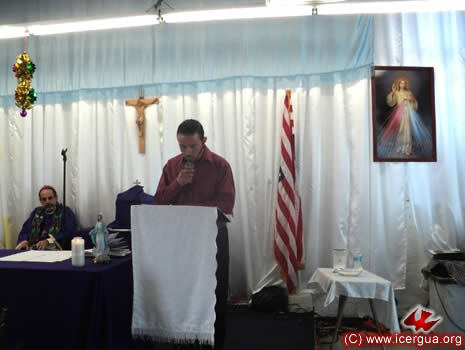 SACRAMENT OF RECONCILIATION IN THE “UNA VOZ DE RESTAURACIÓN” COMMUNITY, LA. 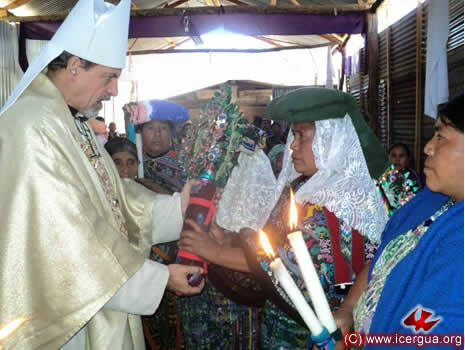 In the evening, the bishop visited the “Una Voz de Restauración” Community. The visit centered on the celebration of a Liturgy of Reconciliation. At the end, the majority of the faithful participating made the confession of their sins and came forward to receive absolution. This was part of the Lenten preparation that they are carrying out. Above: The faithful, having confessed their sins and invoked the outpouring of the Holy Spirit, coming forward to receive absolution. 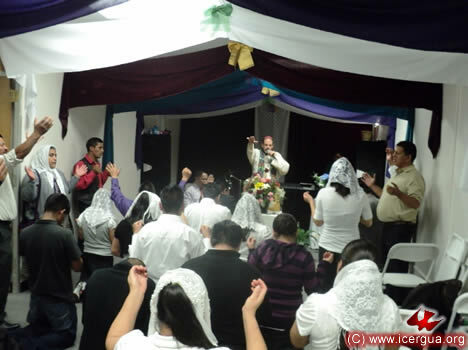 Right: At the end, the Holy Spirit is invoked for those who have received absolution so that, freed from all ties and prohibition they can go forward as witnesses of the presence of the Kingdom in the world. On Sunday, March 13, new courses began at DETYM. This is the new name for what used to be called ESTYMLA. 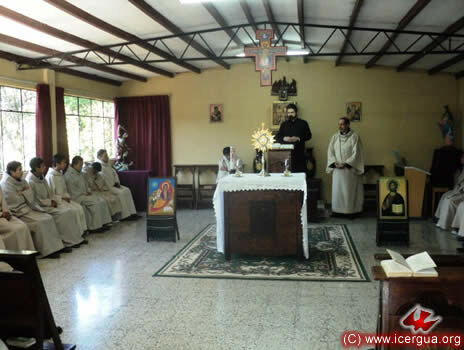 After becoming part of the University Rural, the former School of Instruction for the People of God has taken the name, “Department of Theology and Ministries for the People of God.” The courses that the bishop is giving at present are: “The Synoptic Gospels” and “Christology.” They will last five weeks. The participation was particularly strong for this event. Above: The bishop explaining issues related to the formation of the Gospels. Right: The students following and taking notes on the bishop’s explanations. MARCH 13. EUCHARISTIC CELEBRATION WITH MINISTERIO PESCADOR AND STUDENTS OF DETYM, LA. On the afternoon of March 13, Eucharist was celebrated with the members of the Ministerio el Pescador and the DETYM students. 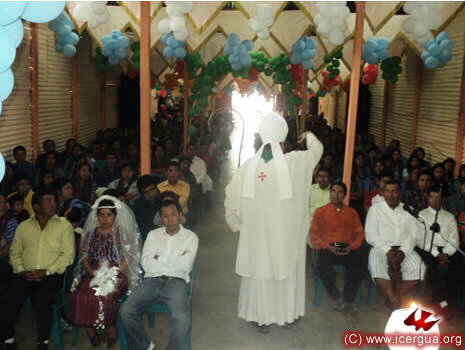 Many participated in the celebration, which the faithful had prepared very well. 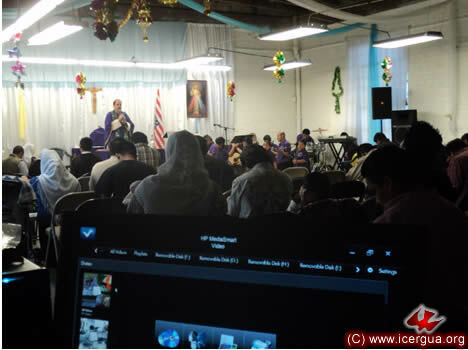 Among the projects that are taking place in the Los Angeles Parish is the formation of various ministries so that the liturgy can have all the seriousness and beauty that it ought to have. 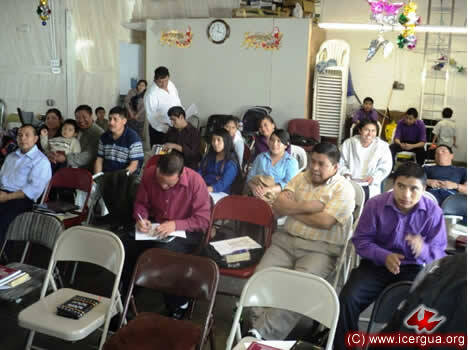 Beginning in April, there will be instruction for the faithful who carry out the various ministries. 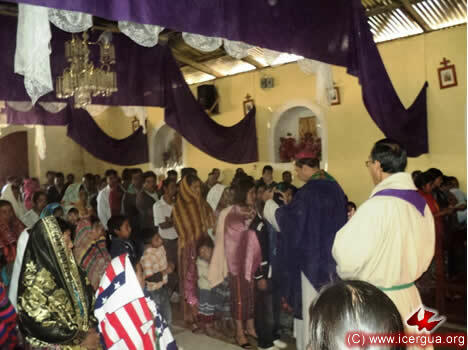 On Saturday morning, March 19, Monsignor Eduardo presided at the celebration of the Feast of San José with the sodality of San José Poaquil, Chimaltenango. The festival was in honor of the town’s patron saint. The faithful that form the Poaquil Community are the present-day recipients and practitioners of an uninterrupted tradition going back to the beginning of the town. Little by little the number of members has grown, and now they are putting much serious effort into becoming better organized in order to be able to be a Renewed Catholic Parish in the near future. Above: The bishop singing the Collect. In the background are some of the members of the sodality with their respective insignias, signs of their capacity to represent the People of God and of the ministry that they exercise, which they have received as a link in the unbroken chain that began with the first town fathers. 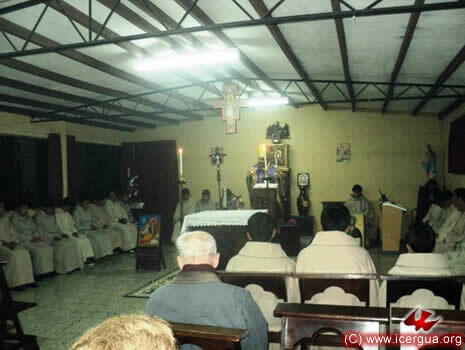 During the festival of San José, the sodality of San José either changes its leader or renews for another year the commissions of the persons who were leaders in the previous year. In this case there was a renewal of the charge. The head of the men’s section is the Brother, who is assisted in his work by three overseers. For the women’s section, the head is called the Captain, and she is assisted by a group of Guild members, called Texeles. 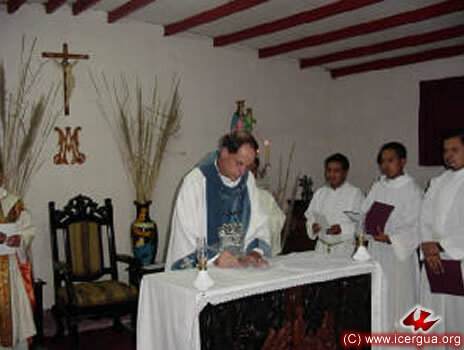 Above: Monsignor Eduardo, having received the Brother’s promise to carry out his charge faithfully, gives him the insignias that symbolize his position as the Brother of San José. Right: Delivery of the insignia to the Captain of San José, who is accompanied by the Texeles (members of the Guild). Also on March 19, after noon, the bishop had a meeting with all the members of the sodality. 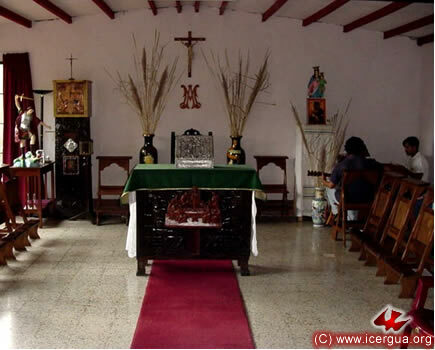 It took place in the house where the Palm Sunday Sodality has its headquarters. The bishop walked through the town’s streets from the place where the Eucharist was celebrated to the house of the Palm Sunday Sodality. He was accompanied by the brothers and the captains. 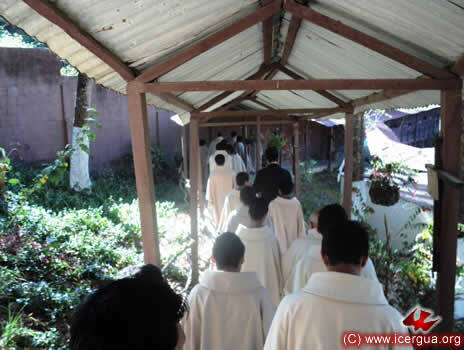 Above: The bishop, accompanied by seminarian Edy Divas, who is doing his pastoral work in San José Poaquil, and by the members of the sodality, on his walk to the house of the Sodality of Palm Sunday. Right: On arriving at the Palm Sunday Sodality, the meeting began with a prayer and the bishop’s blessing. In the photograph at right: giving the blessing to the members of the sodalities. 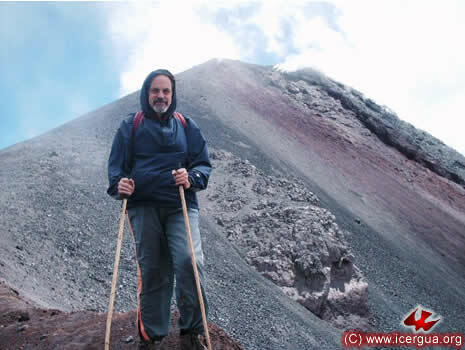 On Sunday, March 20, our bishop, accompanied by four seminarians, climbed to the top of the Yepocapa, Acatenango and El Fuego volcanoes. The principal reason was the celebration of the Eucharist on the peak of El Fuego to pray for peace and reconciliation in Guatemala. 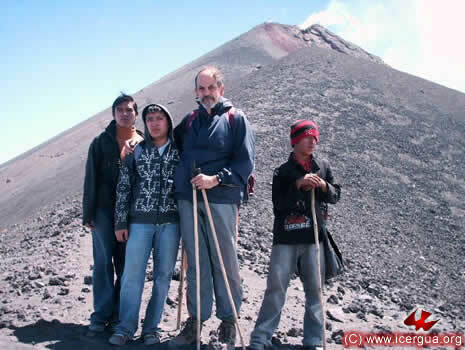 Above: After ascending to the top of Yepocapa, Monsignor Eduardo, followed by seminarians Alfonso, José Antonio and Jorge prepare to ascend to the peak of Acatenango. Right: Monsignor on the descent, after climbing to the top of El Fuego. 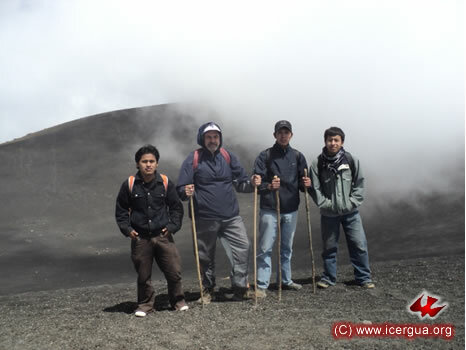 The volcano was very active, so the climb had to stop a few hundred meters from the crater. 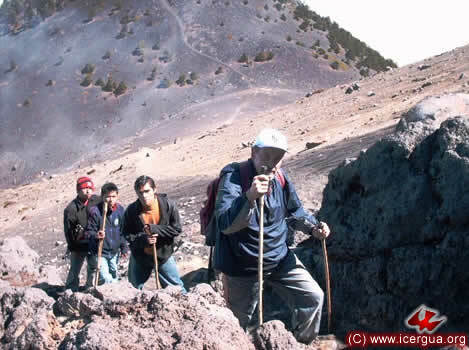 Left: After descending from the top of El Fuego, the group is preparing to begin the descent of the crotch, as the valley between El Fuego and Acatenango is called. 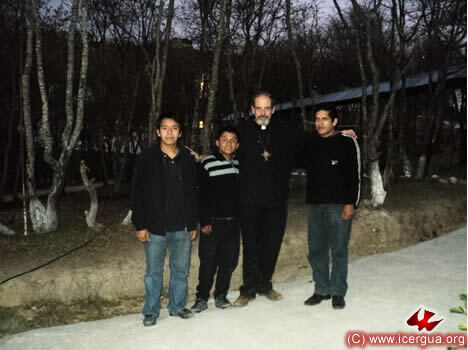 Left to right: José Antonio, Eduardo, the bishop and Jorge. 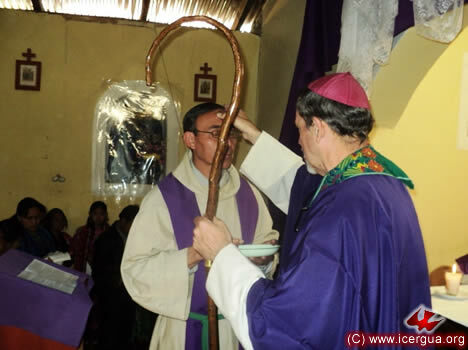 Sunday, March 20, was the centenary of the birth of Monsignor Angélico Melotto, the first bishop of the Roman Catholic Diocese of Sololá and a true father and mentor of our bishop. Monsignor Melotto was born in Sarego, Vicenza, Italy, March 20, 1911. Ordained a priest on July 19, 1937, he was a missionary to China for fourteen years. 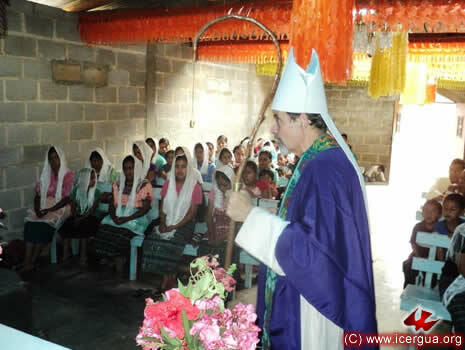 He came to Guatemala at the end of 1950, and was the parish priest in Bananera, Izabal, then in Totonicapán, and again in Bananera. 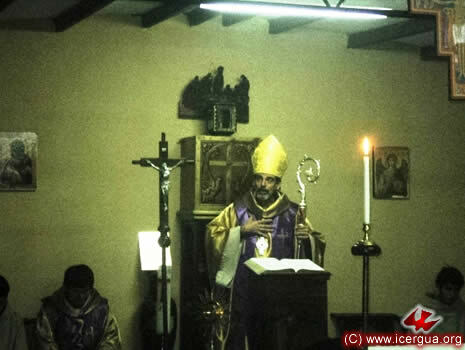 In 1958 he was appointed Apostolic Administrator of Sololá and on July 19, 1959, was consecrated as Bishop of the Diocese. Our bishop, who at the time was not quite seven, met Monsignor Melotto. In 1967, when our bishop entered the seminary, the relationship and friendship between them grew. Beginning in that year, our bishop spent the better part of his vacations from the seminary at Monsignor Melotto’s residence. He was with him when he visited San Juan Comalapa for the first time in November 1967. In 1971, Monsignor Melotto sent seminarian Eduardo Aguirre to study in Rome. On his return to Guatemala in 1978, having earned the Doctorate in Theology in the Gregorian University in Rome, our bishop served as Monsignor Melotto’s Secretary, Chancellor of the diocese, director of the Vida Cristiana magazine and Director of the Young Peoples Pastorale. 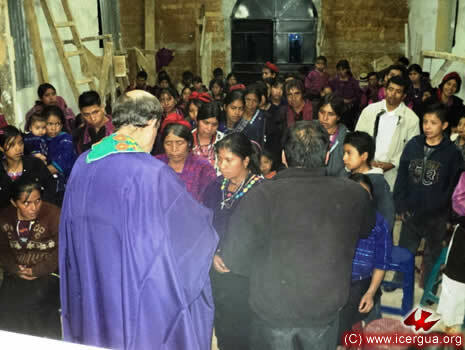 In 1981 Monsignor Melotto authorized our bishop to found the Community of Caminantes in Prayer, which then in 1982 became the Greater Seminary in the Sololá Diocese. 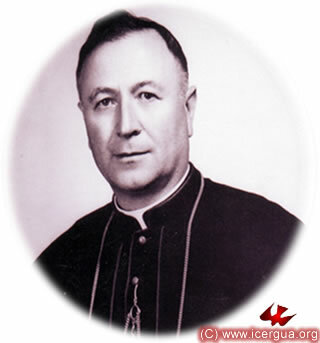 In 1981 Monsignor Melotto appointed Father Eduardo Aguirre Adjunct Vicar General for the diocese. Then he requested that Father Aguirre be given the title of Monsignor. Monsignor Melotto’s witness and apostolic zeal was undoubtedly deeply ingrained in our bishop’s ministry. Monsignor Eduardo was close to Monsignor Melotto until the day of his death, May 11, 1999. Our bishop inherited his personal effects, and so Monsignor Melotto’s presence in our midst has been not only moral and spiritual but also material. The celebration consisted of the Eucharist on March 20, followed by a series of meetings on the person of Monsignor Melotto, conducted by our bishop from Monday until Thursday. The celebration concluded with a High Mass celebrated in the Monsignor’s memory on Thursday, March 24. In the first photograph above referring to the celebration: Monsignor Melotto at age 70. Above: Our chapel just before communion. The altar, the base of the tabernacle and the rug had been in Monsignor Melotto’s private chapel. 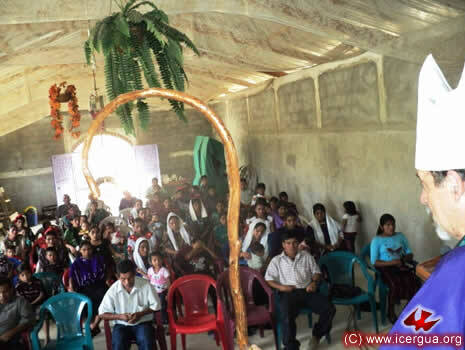 Now they are are used for the anniversary celebrations of ICERGUA in our Education Center in Huehuetenango. Above: Our bishop during the homily during High Mass on March 24. The miter and crosier that our bishop uses belonged to Monsignor Melotto. They had been given to him by the faithful in the town of his birth the first time he went there after becoming a bishop. Right: The Eucharistic celebration. Our bishop took advantage of the occasion to emphasize in connection with the readings for the day the fidelity and unconditional devotion that always characterized Monsignor Melotto. 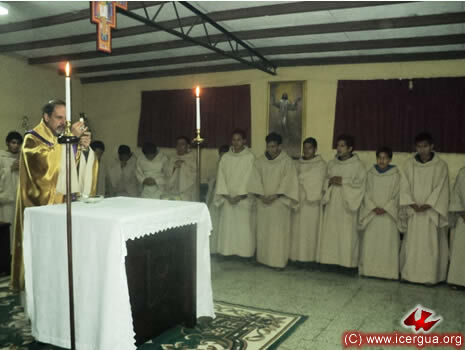 Left: The Eucharistic celebration showing some of the seminarians. On the morning of March 25 our bishop presided at the Eucharist in our seminary to commemorate the eighth anniversary of the birth of the “Communion of Saint Mary of the New Exodus” and the “Nazareth Community,” names which today designate the community of priests and seminarians of our Church. Left: The signing of the Founding Minutes, March 25, 2003. At the extreme left, partially hidden, are Fathers Rigoberto and Francisco. In the center, Monsignor Eduardo putting the first signature on the Founding Minutes. At right are some of the seminarians who also participated in the signing. Since 2003, our church has been consolidated and has defined its perspectives and its mission—namely, to rediscover, accept and implement in its totality the one, holy, catholic and apostolic church. This conviction has continued to leave its mark on our all outreach in ecclesial dialogue and even the decoration of our chapel. 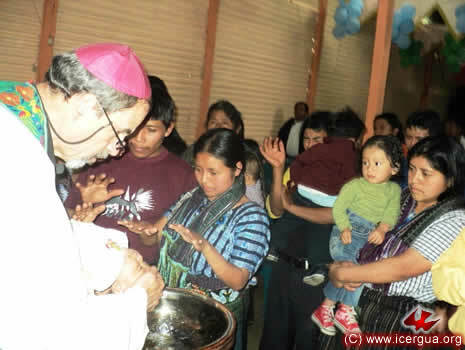 Although the place of the signing has not changed, the Communion, which eight years ago was the only entity that had come into being, today has become the heart of ICERGUA. As presbyters and seminarians we feel called to live with radicality the mission the Lord has entrusted to us, so that, returning to the authenticity of the Church that Christ founded, we may all be one as the Father and Son are One in the Holy Spirit. We are convinced that this requires on our part that, like Most Holy Mary, we know how to live in constant fidelity and openness to God, making her “Be it unto me according to Your Word” the basic standard of our life. 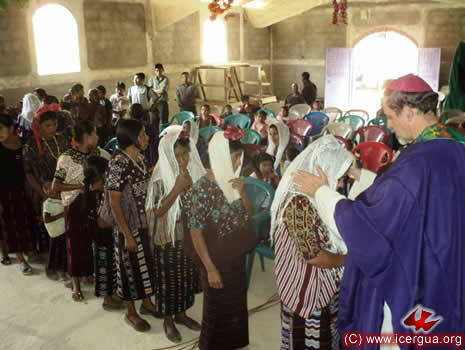 On Friday afternoon, March 25, our bishop visited the “Efusión del Espíritu Santo” Community in Santiago Atitlán. 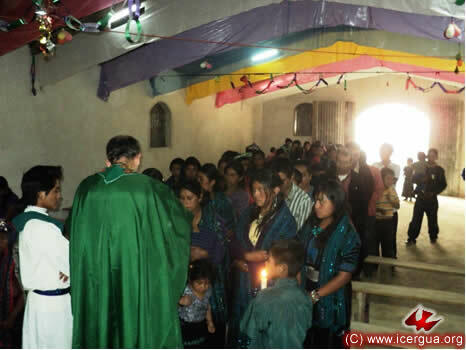 In addition to the Eucharist, the community had prepared a wedding and the Christian Initiation of several children. In the conversation that the leaders had with Monsignor Eduardo before the Eucharist, they shared their enthusiasm for the sustained growth that they continue to experience. Above: The homily. In the foreground can be seen the couple that are marrying. 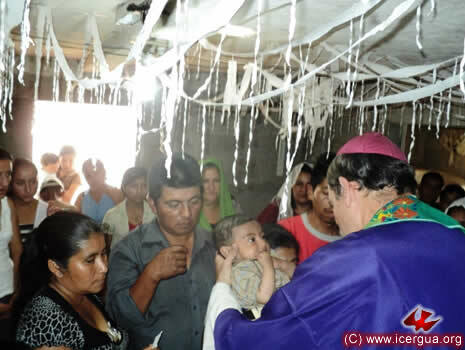 Right: The baptism of some of the children that are about to be initiated into Christian life. 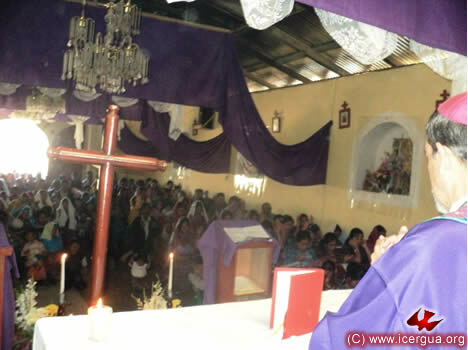 Near sunset the bishop celebrated Eucharist with the “Pentecostés” Community, located in the center of Santiago Atitlán. Left: Those who had confessed their sins coming forward to receive absolution. 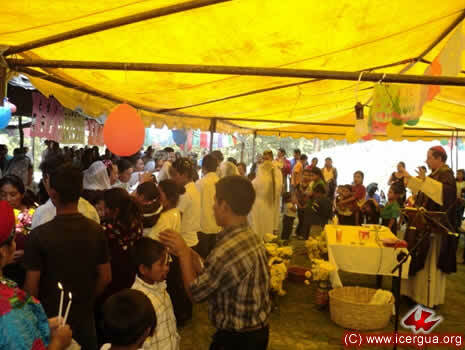 On Saturday morning the Mapá community, San Sebastián H., Huehuetenango, met for the celebration of the second anniversary of its covenant with ICERGUA. The faithful prepared the celebration brilliantly. 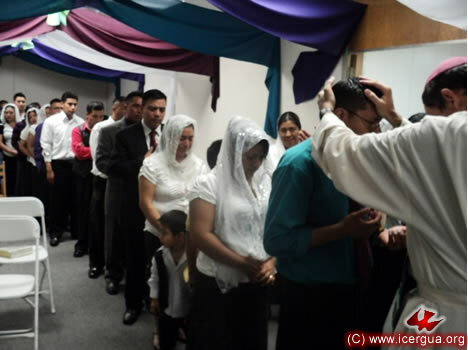 Eight couples in the community who were living together decided to contract sacramental matrimony. In addition twelve children were initiated into the Christian life, receiving the sacraments of baptism, chrism and communion. Above: The faithful who had confessed their sins raise their arms as the bishop does the epiclesis, praying for the outpouring of the Holy Spirit for the forgiveness of sins. In the first row are the couples that are marrying. 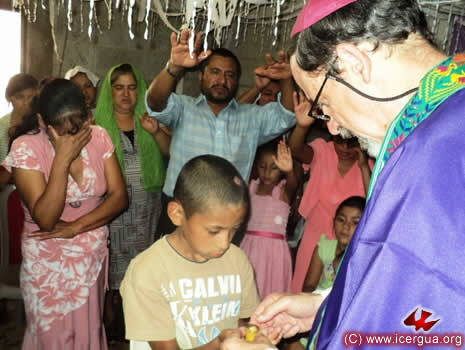 Right: One of the children being initiated into Christian life during the administration of the sacrament of Baptism. 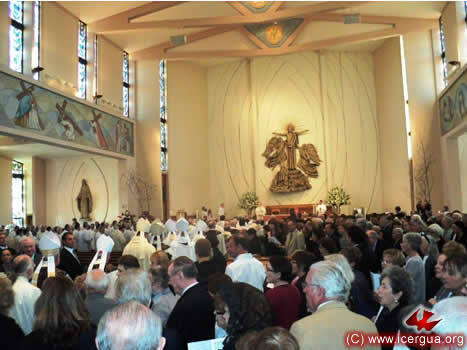 Left: At the end of the rites of baptism and chrism, the parents and sponsors pray over those had been initiated, asking of the Lord the grace for them to persevere in the Christian path. MARCH 26. 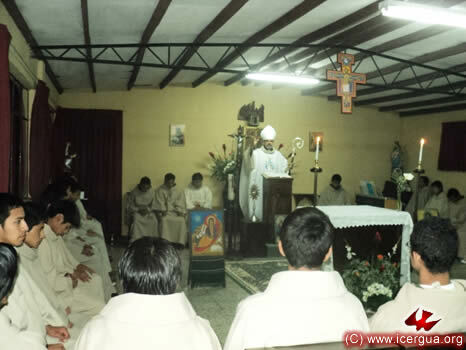 VISIT TO THE RENEWED CATHOLIC COMMUNITY OF LA ESPERANZA, UNIÓN CANTINIL, HUEHUE. 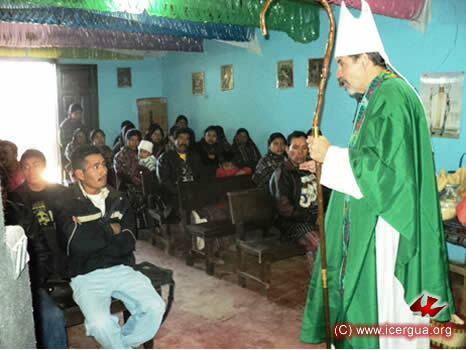 On Saturday morning, March 26, our bishop visited the La Esperanza Community, Unión Cantinil, Huehuetenango. A child was initiated into Christian life and for another the sacrament of extreme unction was administered. Left: Some of the participants raising their hands while the bishop invokes the outpouring of the Holy Spirit for the forgiveness of sins. Then each of those who had confessed came to receive absolution. 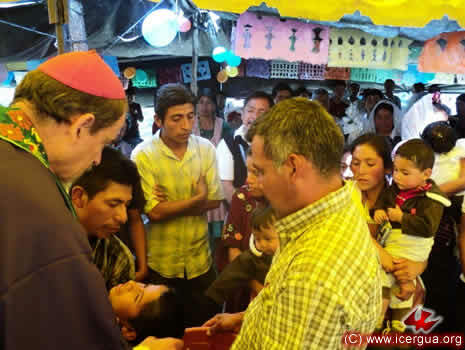 Right: The bishop returning to the parents and sponsors the child that had been baptized, saying to them, This child is now a child of the living God. At the end of the Eucharist extreme unction was administered to a child who had suffered a complete physical breakdown. 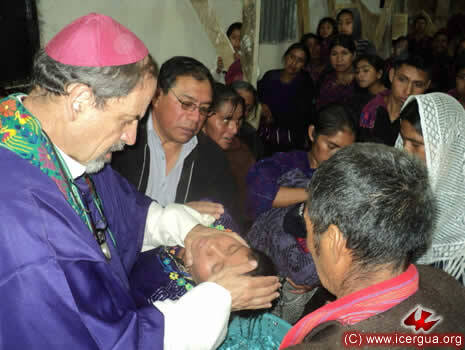 Left: The bishop anointing the hands of the child who is receiving the sacrament. 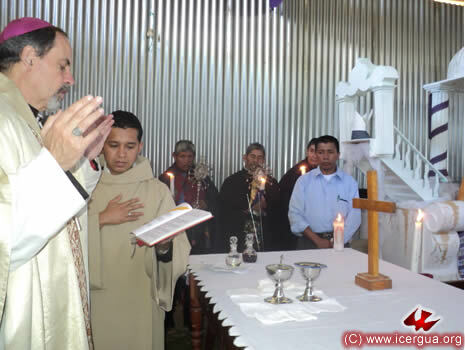 In the afternoon, the Monsignor presided at the celebrations of Reconciliation and of Eucharist with the La Nueva Esperanza Community, La Democracia, Huehuetenango. 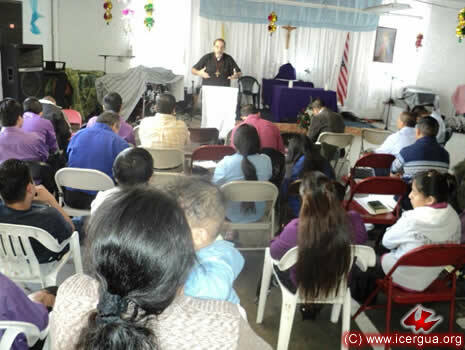 Under the self-denying leadership of brother Rogelio, the faithful found the encouragement to keep on trying to urge the faithful who had left to come back into close fellowship. Above: At the beginning of the celebration the bishop inviting those present to repent and confess their sins. Right: The homily. The bishop is exhorting the participants to base their lives on the rock of Christ in order to be built as living stones into the church. 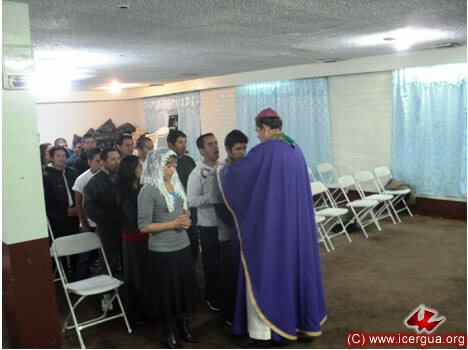 During the bishop’s visit, five of the faithful were initiated into Christian life. 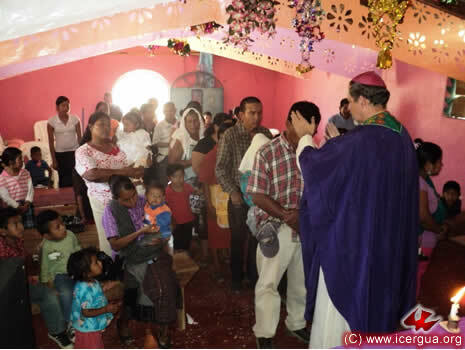 In the photograph at left, Margarita, after confessing her faith, receives the sacrament of baptism. At the end of the celebration of baptism and chrism, the parents and sponsors come forward to pray over those who had received the sacraments. 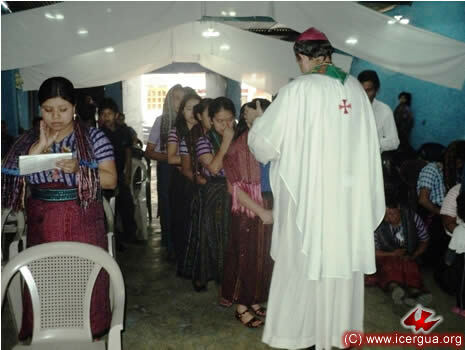 Christian Initiation concluded with the administration of Holy Communion, during the Eucharist. 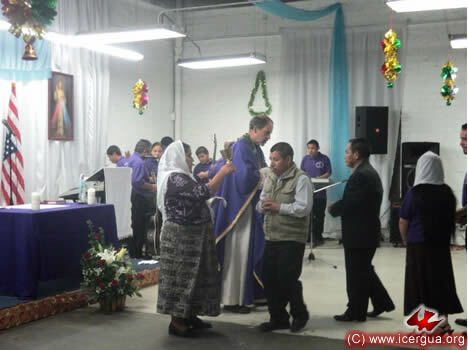 Left: The neophyte Margarita comes to receive communion. MARCH 27. 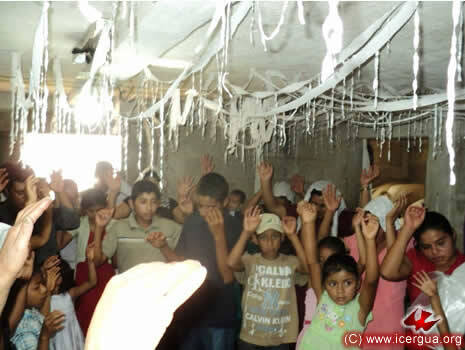 CHRISTIAN INITIATION FOR TWO CHILDREN IN SANTO DOMINGO, LA LIBERTAD, HUEHUE. 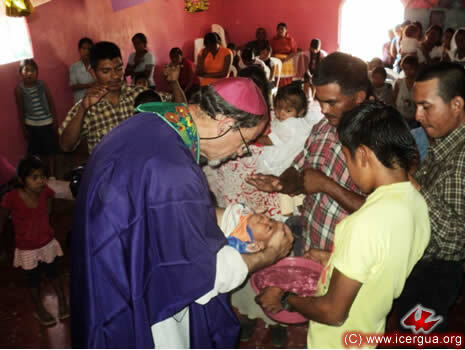 On Sunday morning, March 27, our bishop visited the community of Santo Domingo las Flores in the municipality of La Libertad. The bishop was surprised to see how much the construction of their future church had progressed since his last visit as well as the size that it is going to have. In the celebration two children were initiated into Christian life on the promise of parents and sponsors to live in Christian faith. Above: The faithful coming forward to receive absolution from sin. Right: The homily. The bishop invited all the participants to come to Jesus so that He might give them the water of the Holy Spirit, as He did to the Samaritan woman. The two children initiated into Christian life were Óliver and Mireyda. Left: Óliver receiving the sacrament of baptism. 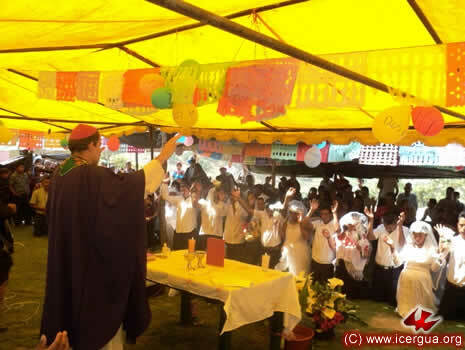 On Sunday afternoon, March 27, Monsignor Eduardo presided at the Eucharistic celebration with the San José Ixcunén Community, La Democracia, Huehuetenango. Before the Eucharistic celebration, the Sacramento of Reconciliation was administered. Left: The faithful, who have confessed their sins, are coming forward to receive Absolution. During the homily, the bishop stressed that by the outpouring of the Holy Spirit, the Lord has changed us into vessels of living water, from which all the people may satisfy their thirst. Therefore, the missionary commitment is an essential part of following Christ and of fidelity to his having elected us. At the end of the celebration, Santiago, a member of the community who had fallen away, came forward to show his change of heart and to be reconciled. 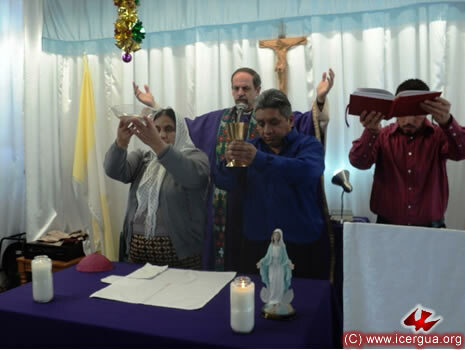 Left: The bishop, along with the other faithful pray for the recently reconciled person, asking the Lord to give him the power to persevere in his intention and to be a witness to the presence of the Kingdom in our midst. 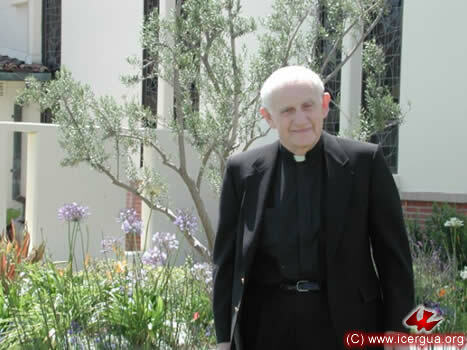 On Monday morning our bishop went to Los Angeles, California to attend the funeral of Monsignor Michael Lenihan. Our bishop has known Monsignor Lenihan since 1985, when he edited the Constitution and General Directory of what was to be the Mission Brotherhood of Mary. Since then and up to then present, our bishop and Monsignor Lenihan have had a deep friendship. When our bishop visited Los Angeles to tend to the parish of San Miguel Arcángel he was always the guest of Monsignor Lenihan. Monsignor Lenihan’s intimacy with our bishop, his care and above all his love for the ordained ministry and his heroic pastoral zeal made our bishop love him as an true father. During our bishop’s most recent visit to Los Angeles, he was with Monsignor Lenihan during his last days in his apartment. Eighty-six years old, he was suffering from a respiratory infection. 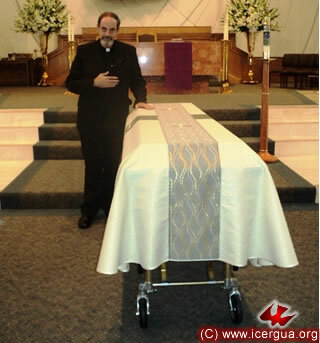 The bishop said goodbye to him at 2:00 in the morning, he was hospitalized at 3:00am and died at 11:00pm that night. Above: Monsignor Lenihan in the garden between his present apartment and the church of St. Lawrence Martyr, where he was the parish priest for twenty-two years. Right: Our bishop at the casket of Monsignor Lenihan in the Church of St. Lawrence Martyr. The funeral Mass was concelebrated by several bishops and dozens of priests; hundreds of parishioners participated. Left: The entrance procession down the central aisle of the church. As previously announced, the name of our Education Center for the People of God changed. Now its name is the Department of Theology and Ministries for the People of God (DETYM). There are about forty men and women in the different levels of education. 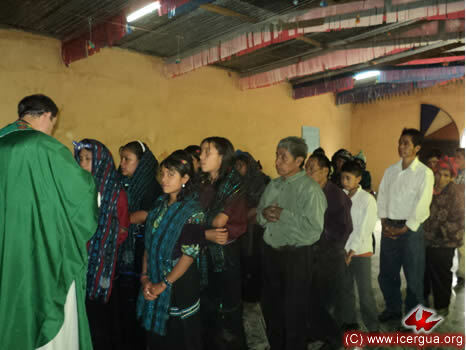 The greater part of them come from near Huehuetenango since the presbyters assigned to them serve also at the School of Theology. 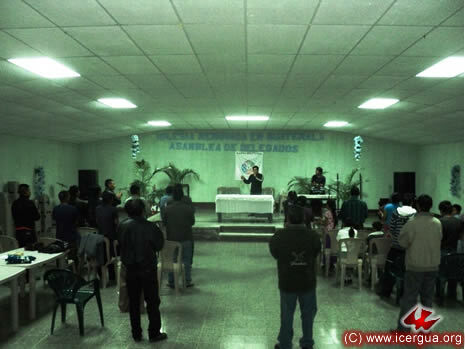 Instruction is given by seminarians: José Hernández, Charley Cumez and Fredy González. Above: View of the sleeping quarters at the Education Center. Right: The hallways that go from the bedrooms to the dining room, which can be seen in the upper part. Left: View of the multiple-purpose room at the Center. 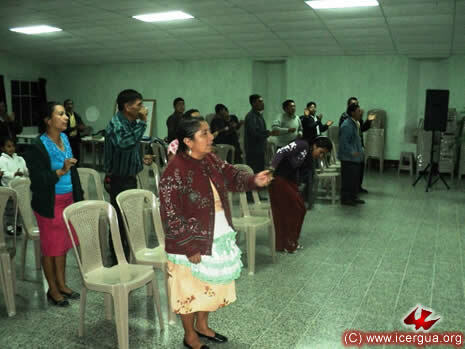 This is where the Assemblies take place, and also where the faithful meet for plenary instruction.